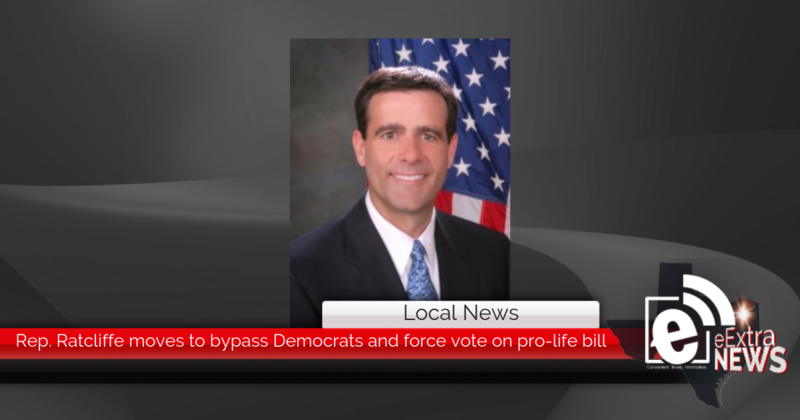 Rep. John Ratcliffe (R-Texas) moved to force a vote on major pro-life legislation today by signing a discharge petition (H.Res. 102) that was filed in the U.S. House of Representatives. House Democrats tanked this effort and refused to vote on legislation that sought to ban infanticide. “We’ve seen the Democrats’ radical political agenda jeopardize our national security, drive up health care prices and sabotage our economy – but outright refusing to close the legal loopholes that are allowing infanticide is most definitely a new low for my colleagues on the other side of the aisle,” Ratcliffe said. If successful, the discharge petition would have brought the Born-Alive Abortion Survivors Protection Act(H.R. 962) to the House floor for a vote. This bill would prevent infanticide by requiring health care practitioners to provide the same care to children born in an attempted abortion as any other child born prematurely at the same gestational age. Current law does not guarantee the same level of proactive care for babies born alive in an abortion attempt as any other baby, which allows doctors to leave them to die from insufficient medical care or neglect. The discharge petition received 191 signatures on the first day alone, including Ratcliffe, narrowly missing the simply majority required to bypass Democratic leadership and bring the bill to the floor. This marks the most signatures on a discharge petition in a single day in the last 22 years. All but two Democrats refused to sign on. NextParis Bobcat grand opening slated for April 6 from 9 a.m.-1 p.m.